Bed Bug Freeze Treatment Can Be Effective in Certain Scenarios. Killing Bed Bugs by Freezing! Pest control companies often get asked "Will freezing temperatures kill bed bugs?" or "If I put clothing infested by bed bugs in the freezer will they die?" The answer is it depends. A bed bug freeze treatment is best left to professionals. Just like a steam treatment-- a bed bug freeze treatment is a localized treatment. You cannot freeze an entire bed or an entire wardrobe. The good news is a properly trained bed bug pest control professional will be able to introduce freezing temperatures to the common sites where bed bugs hide. A bed bug freeze treatment is also a good strategy for treating sensitive items that cannot be treat any other way. The great news is HeatRx has all of the equipment necessary to solve any bed bug problem. HeatRx will not just use freeze treatments to eliminate bed bugs. Freeze treatments are most effective when used in combination with other treatments. Like any great tool it has its time and place to be used. We train our employees to use the proper tools for the best results. Our bed bug specialist will give you a written quote with a clear plan of action at the end of our site inspection. The University of Minnesota has created some great information that outlines the science behind killing bed bugs by freezing. As a courtesy we have included a link to their information here: University of Minnesota Research. No chemicals, no smell, no stress. Photo courtesy of David More Del Pozo. Check out his instagram page. 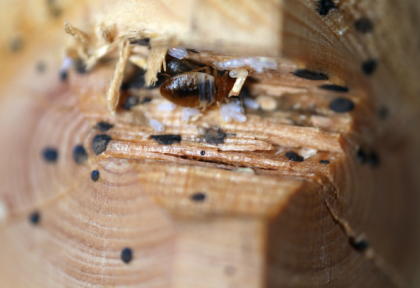 Bed bugs are such a small pest, but they can cause BIG problems. The picture to the left is a bit misleading it makes the bed bug look big when in reality a full size adult is about the size of a small apple seed. (It is common for carpet beetles to be mistaken as bed bugs.) The eggs are much smaller and can barely be seen with the naked eye. The image to left shows perspective on the size of bed bugs. A well trained technician who knows the common spots of where bed bugs lay eggs will have good results using freeze treatments. Freeze systems have been proven to eliminate 100% of bed bugs eggs treated. 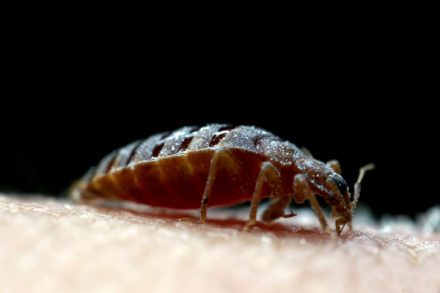 Schedule a FREE bed bug inspection! HeatRx can give you a great night's sleep again. HeatRx is the best choice for a bed bug treatment. We are experts in freeze treatments, heat treatments and conventional treatments. If you need a bed bug exterminator near you... we will be there. Serving the entire Bay Area of California.